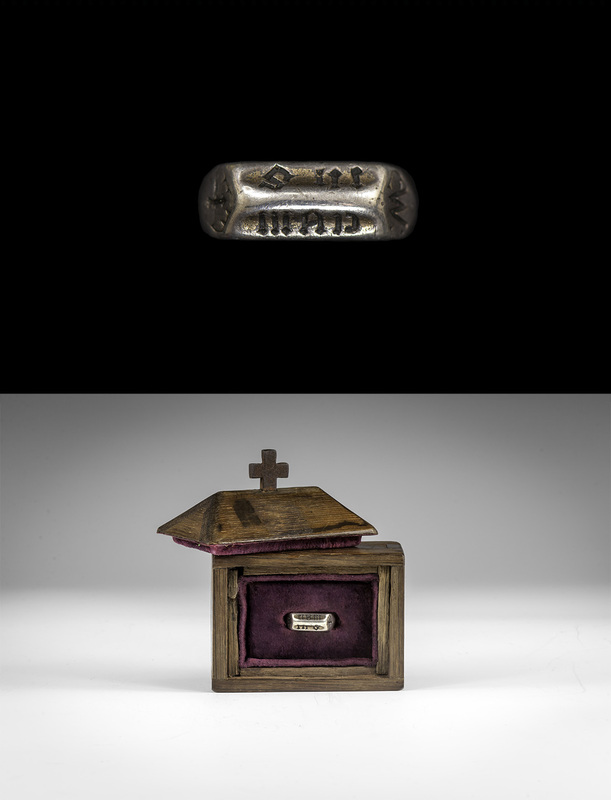 A 15th century silver-gilt iconographic ring associated with Joan of Arc was sold by TimeLine Auctions for £297,600.00 including buyers premium on Friday. The ring, owned by the son of a French doctor who came to Britain with General de Gaulle in World War II, was offered at the Bloomsbury, London auction on 26th February. It has been on public display several times in England and France, on loan to several museums and at exhibitions devoted to the French national heroine, who was burnt at the stake in 1431 for heresy. The ring’s connection to the saint has been documented for over a century, and was published by F.A. Harman Oates in his privately printed catalogue of 1917. It was kept in an oak reliquary casket and was sold with a book of excerpts from national newspapers in Britain and France, as well as research notes compiled by Cyril Bunt in the 1940s, BBC features on the ring and exhibition catalogues. The ring is unusual for its type in having text rather than an image of saints on its faceted bezel. It matches the description Joan gave at her trial of the ring given to her by her parents, and is inscribed ‘I M’ for ‘Jesus Maria’. With the documentation, the ring was estimated at £10-14,000. Interest was very strong and on the day the bidding exceeded all expectations.